No, this isn’t the latest video game or VR experience. Believe it or not, this is an 8-year-old boy confidently applying geometry to a real-life problem/situation. Along with 11 other children and their families, Max and his mom are working together to design an exhibit to add to the collection at the New York Hall of Science (NYSCI). It’s not every day that kids are given the opportunity to design and make their very own exhibits, and it’s even rarer that they do so by exploring and using the data cycle – asking questions, collecting, analyzing, organizing and finally interpreting data. This rapid growth of “big data” has influenced all of our lives. Most U.S. children are now growing up in a world where they encounter the effects of data analytics every day. However, topics of big data and data science typically circulate around traffic patterns, stock market trends, and digital information, topics that kids just cannot relate to. There seemed to be a significant piece of the puzzle missing – When is it appropriate to start the conversation? At NYSCI, our staff found that this gap lies with our young learners (4 – 8-year-olds), and developed the Big Data for Little Kids curriculum aimed at creating opportunities for families (parents, children, and siblings) to connect over the topic of data science and literacy. Given that data science is an uncharted topic for most people, our innovative curriculum was an accessible and approachable way for parents and children to become co-learners and ease into this complicated, convoluted and intricate topic together. By using our own exhibitions, the curriculum provided an opportunity for the families to take a deeper look at exhibits that are developmentally appropriate for the youngest learners. These exhibits served as a starting point for parents to talk to their children, children to talk with other children, and families to talk to each other about the inner workings of exhibit design and the important role that data plays in the design process. The design of the curriculum followed NYSCI’s inquiry-based approach to children’s learning called Design, Make, Play. 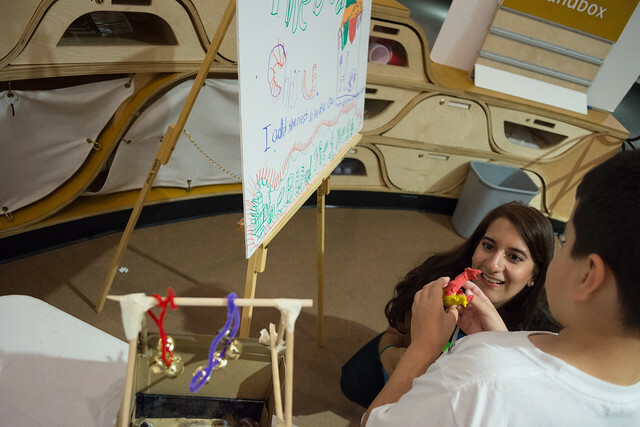 At NYSCI, children are encouraged to decide on a problem that is meaningful to them before they can start designing a solution. The Design, Make, Play approach capitalizes on the deep-seated interests of children and provides rich museum experiences that invite families to discover the wonder and joy of science learning together, through fostering materials literacy and tool use, motivating young learners to explore their world, and empowering children to apply the new concepts, processes and skills they learn – at home, at school, and in their communities. Design, Make, Play draws on a wide range of research and has demonstrated to be an effective teaching strategy for tackling difficult concepts and engaging diverse learners that are often ill-served by more traditional approaches. To pave the way for merging complex concepts of data science and the Design, Make, Play approach, NYSCI staff compiled research from early childhood and mathematics education to construct the contents of the Big Data for Little Kids workshop and curriculum. Specifically, staff adopted the theoretical frameworks of data modeling (English, 2012; Lehrer & Schauble, 2002) that have been used successfully in the classrooms to engage young students in using data to solve everyday problems, such as deciding which soup a school cafeteria should serve. The workshop is a step forward in expanding the framework not only into informal education settings but also to a diverse, mixed-age audience of families from local communities. The Big Data for Little Kids workshops (aptly named Museum Makers: Designing With Data) took place over the course of six to seven weeks where families investigated the overarching question: “What is missing from NYSCI’s exhibits?” Families gathered various kinds of data about NYSCI’s exhibits and used the information to help them design their own exhibits. The curriculum was designed to lead the families through different topics of data science and literacy each week (e.g., units of measurement, a continuous spectrum, and categorical data), and to invite them to collaborate and discuss about what data they were going to collect, how they were going to collect it, and why the data was important to collect. In the first few weeks, the families went through mini versions of the data cycle – asking questions, collecting data, analyzing data, and interpreting data ¬ to help them design their own exhibits. At the end of these workshops, the families aggregated their individually collected data into one large class set that they then had to organize and interpret the story that they wanted to tell. Before the last workshop, families had a chance to look back at all the data that they had collected over the previous weeks. Reviewing the tools and materials that they used during the earlier workshops served as a reminder of all of the different decisions that they had to make in the process of designing their exhibit. The final workshop transformed NYSCI’s Design Lab into an exhibit gallery – where NYSCI’s very own staff of exhibit developers cut the ribbon for the grand opening of the Museum Makers Exhibit Showcase, where the families presented their exhibits to visitors and staff. After collecting and organizing data on NYSCI’s Seeing the Light exhibition, Max’s analysis sparked an idea for the exhibit he would ultimately design. Max examined all of the individual exhibits within Seeing the Light and discovered that the missing component was a mechanism and method for visitor interaction with the lights. His exhibit “Archery Contest,” described as a “bow and arrow physics exhibit,” allowed the visitor to maneuver a bow and arrow in order to activate a series of lights leading up to the larger light as part of the Lux Rota exhibit. Max and his mom are just one example of how museums can help families work together to investigate a complex topic in an extensive and meaningful way. Given the unique opportunity, young learners are in fact very capable of learning about data science, and a science museum appears to be the perfect environment for success. English, L. D. (2012). Data modeling with first-grade students. Educational Studies in Mathematics, 81(1), 15-30.